Coffee and a Book Chick: Google Reader Retiring... Do You Know Feedly.com? 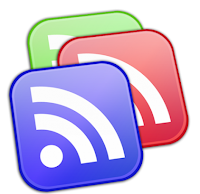 Google Reader Retiring... Do You Know Feedly.com? So here I am, trying to somehow fit blogging back into my regular day-to-day, and I log back into Google Reader to catch back up with everyone... and I am greeted with a fairly jarring message that Google Reader is all sorts of done come this July. Wha? How am I going to organize the blogs I follow? If I find another reader service, do I have to write down each blog name and manually type it into this new service? What a pain! What is the deal with Google discontinuing their products? First Picnik, the photo-editing site, and now Google Reader? What's next, Gmail? I don't really care about Google+, but if I see Gmail go away, I know I'm going to be just past my tolerance threshold for products I love that get discontinued. With a few helpful searches (on Google! *gigglesnort*) I came across articles that offered alternatives. I've chosen Feedly.com for now. Feedly.com: This seems to be the most reliable alternative. It will connect directly to your Google Reader and download content and they have PROMISED that they will continue successful migrations past the July 2013 retirement of Google Reader. I started using it today and I really like the format. 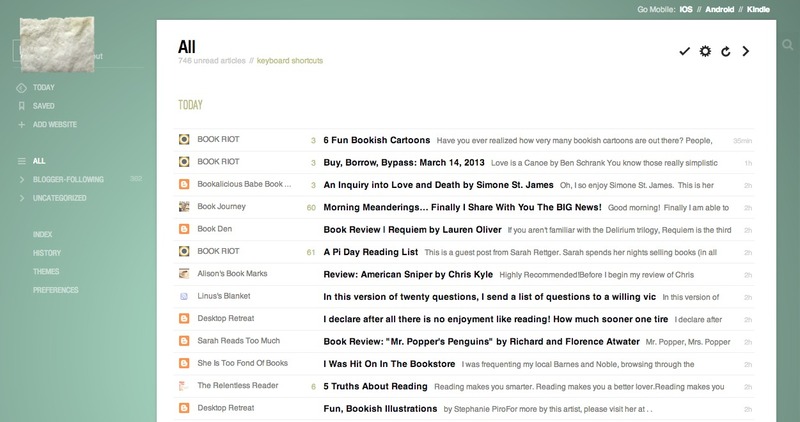 Visually, it's a lot prettier to view and doesn't seem so boring, like Google Reader was. Here are two screenshots of what my Feedly looks like. Not bad, right? I'm not sure what their process is for certain articles or blogs to be "featured," but you can see on the right-hand side that there is an initial list of most recent blog posts. Then, you can click a different button and view all posts that are brand new in almost the exact same perspective as Google Reader, but it looks so much nicer. You can change the colors in the appearance as well. So the bottom line is that while it makes sense for Google to streamline their efforts to focus on a few products versus spreading themselves too thin and having too many products, thus watering down their internal efforts to continue to be a powerhouse, it's still not fun for the average consumer/blogger reader like you and me. For now, I'm going to play with Feedly.com for a few weeks and see if I like it. Doesn't seem so bad right now. Any other services you prefer to use for blog reading that you can recommend to everyone? I'm in the same place. I loved Picnik and was in denial about Google Reader until I opened my Reader yesterday to that icky message. I've got several recommendations about Feedly. I've also heard BlogLovin, Taptu, Pulse, and Old Reader. I can't decide. I'm going to need to try several and see what sticks. 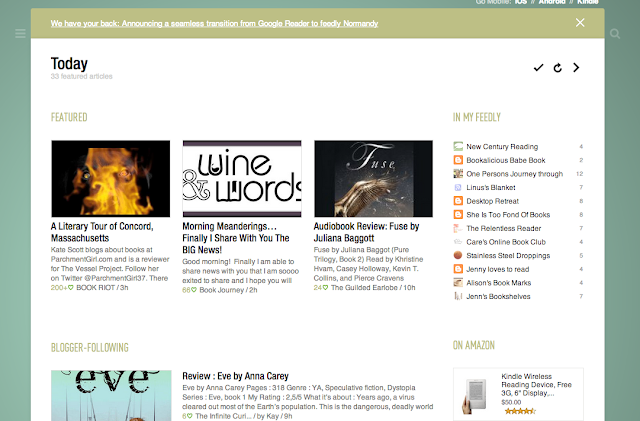 Feedly must be defective since I can't see my blog listed there! HA HA HA. No seriously, I have no idea what to do but I'll undoubtedly wait to see where most people go! The part that worries me is this. It says: "Worryingly, Feedly actually uses Google Reader as its backend — and we’re not sure if Google will break the functionality of third-party apps like Feedly when it integrates Reader with Google+." I've read that Feedly has promised it will successfully continue past the July retirement, which is why I tried it today. Hopefully they stick to that promise. Maybe the best thing to do is set up a couple of services so that there are back-ups and that way you can test it out to see which one fits your needs best. I really never liked Google Reader and made the switch a couple years ago. I've been really pleased with BL. It isn't RSS, per se, meaning it opens the blog in a different window, but I really like that. I like "seeing" the person's blog. I also like the share options and the organization. I'm still using GR so need to investigate new sites too. Feedly does look impressive but that comment from Juju looks worrying. I'll have to do a bit more research I guess! Feedly seems to be the hot leader in this and I've seen them comment on the issue that Juju mentions -- they're hoping to move on after Google retired Reader. I plan to experiment tonight! I just switched to Feedly last night. So far, it's not too bad! I installed feedly today to give it a try and my son told me I shouldn't use it - he said feedly can see everything you do in your browser. Of course, he didn't offer me an alternative. I use Feedly and Netvibes - both are nice. I like Bloglovin - but not love ... but it's interesting that you can see other users that are subscribed to your blog. This seems like the perfect solution, Natalie! Thanks for finding it for us! I was so pissed when I saw that message, and it makes no sense. Google is so shady, and I am thinking about abandoning them altogether. I tried Feedly yesterday and love the look/feel. But now I'm thinking I'm going to try making lists on Twitter instead. I most often click through my Twitter feed anyhow (or through Facebook which I'm on too often), might as well streamline something I already use, kwim? We'll see. I might come back to Feedly eventually. I just tonight made the switch to Bloglovin. It's a little different than Google Reader in that you only see a snippet - but this might be a little better for me because it will actually open the window to read the whole post so I will be more likely to comment more often. It would be easier if they didn't keep discontinuing things! nope, it is all about feedly.